Altecnic is celebrating 30 years of trading as a leading UK provider of high-quality heating and plumbing components. 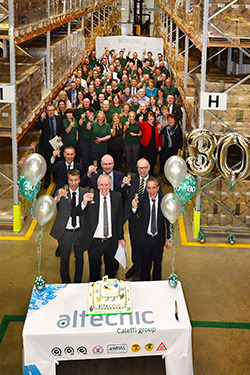 Accompanied by senior directors from Caleffi, Altecnic's Italian parent company, the entire staff at the Stafford-based business turned out to raise a glass to three decades of successful trading and to toast the future. A special cake was made by an Altecnic employee to commemorate the occasion. He continued: 'Without such a dedicated team Altecnic wouldn't be the success story it is. As I reflect on these 30 years, I have to mention the very special relationship we have with our Italian colleagues. The support that we have from everyone in Caleffi is outstanding.